boiler denitrification lance is one of the core components of the whole denitrification system. The performance and quality of the denitrification lance play a decisive role in the denitrification rate, operation cost and ammonia escape of the whole denitrification project. With years of atomization experience, advanced processing equipment and special metal processing technology, our company has laid a solid foundation for creating high quality products. 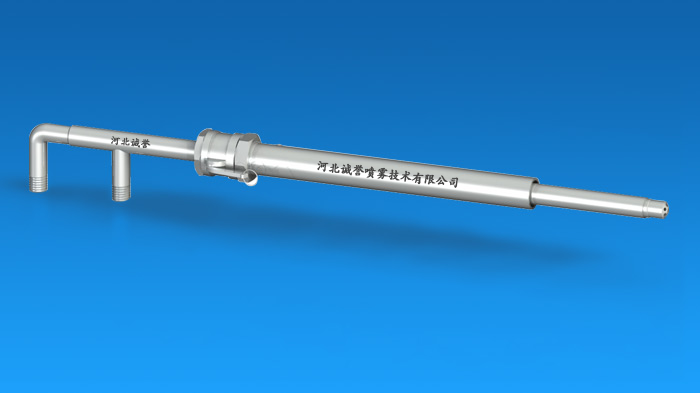 Our company has independently developed, designed and manufactured high-efficiency denitrification spray guns, which have been applied to industrial boilers, heating boilers, cement kilns and other denitrification projects. Through the use of many new and old customers, the denitrification efficiency is over 75%-90%, and the ammonia escape is far below the national environmental protection requirements; it not only greatly reduces the operating costs for users, but also reduces the environmental protection requirements. The service life is increased to 2 - 3 times of the original. The special steel - denitrification spray gun has the characteristics of high temperature resistance (maximum heat resistance temperature 1250 C), wear resistance, acid and alkali resistance. It is processed by special metal treatment process to ensure the quality of denitrification spray gun. Automatic telescopic design - denitrification spray gun is equipped with automatic telescopic mechanism. When the system is out of service, the denitrification spray gun will retract automatically according to the setting requirements, so as to avoid the burning of the boiler denitrification spray gun by high temperature flue gas. It can be controlled on site and remotely, and runs stably and reliably. Unique cooling design - In order to avoid the denitrification lance working in the high temperature environment of 850 ~1050 C for a long time, the fixed denitrification lance has designed a unique cooling protection function, which greatly prolongs the service life of the boiler denitrification lance. Good atomization effect - denitrification lance atomization angle 30 ~90, droplet particles 30 ~70, spray distance from 800 mm to 7500 mm, boiler denitrification lance spray field has strong penetration ability in flue gas, uniform mixing with flue gas, reactant reacts more fully with nitrogen oxides in flue gas to ensure efficient denitrification. Various models are selected - Boiler denitrification lance can be divided into five series: SE, FE, FM, FT and FV according to the model. According to the angle of fog field, it can be divided into five types: 30, 55, 75, 90 and 120. The injection quantity of ammonia water or urea denitrification lance ranges from 2 to 650 L/h, which can be adjusted arbitrarily according to the variation of field working conditions, and can meet the environmental requirements of various denitrification working conditions. Stop-use and anti-blocking function-Designed the stop-use and anti-blocking function of the boiler denitrification spray gun to ensure that the denitrification spray gun will not be blocked even if it is not pumped out in high temperature, high concentration dust and complex airflow environment. Humanized design - denitrification spray gun has simple appearance, quick installation and connection settings, more convenient installation and maintenance, and more safe and reliable operation of equipment. Customized processing - can be designed, processed and manufactured according to the actual situation of the user site and customer requirements.